Based on the description of your addon, I'd suggest not using a ScrollingMessageFrame at all, but instead just creating and managing your own row frames. I'd posted some example code for doing this in this thread several years ago, but after loading it in-game just now to take a screenshot, I noticed it has some graphical issues, so I updated it here. There are examples for a number of concepts in there (loading process, saved variables, event handling, etc) but basically it creates a frame with rows, and updates the rows based on a list of items. 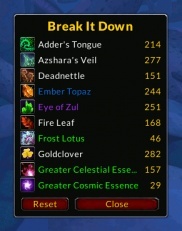 I've attached a screenshot, and you can use "/run BreakItDown:Test()" to spawn some random test rows in-game. Sign in the URL with https rather than non-secure http. Apparently that's a recent thing on the site. Several people have had this issue, myself included. No, that's not the issue (s)he is having... that one is the same issue that's existed for the past 8 years or so, where if you aren't already logged into the site and you try to do anything on the forums, you're redirected to the vBulletin login page, which isn't hooked into the Curse user system, instead of the Curse network login page. There's no workaround or solution; you just have to remember to log in using the link at the top of the site before trying to do anything that requires being logged in.